Outperforming the other options in the 1-9/16" SDS-Max cordless rotary hammer class, Makita dials it with a blend of features, performance, and value that's currently unmatched on the market. Until recently, you needed a cord for any SDS-Max rotary hammer options you might consider. Two cordless models hit the market in the past few years and now Makita turns their gaze to the category. Manufacturers like Makita don’t just spit out tools from concept to 3D print to production in a few months. Their road map is years out with an eye on changing technology. To give the Makita cordless SDS-Max rotary hammer the kind of performance you expect from Makita, we look to the 18V X2 LXT line – 36V power without needing to leave the 18V LXT battery platform. The Makita 18V X2 SDS-Max Rotary Hammer has a Makita-built brushless motor. That’s going to help extend the runtime as we as the overall life of the motor. The 4-finger trigger isn’t variable speed – and we don’t expect it to be on this kind of tool. There’s a variable speed dial that runs from 1 (250 RPM) to 5 (500 RPM). There aren’t any positive stops in between, so you’re free to dial it in wherever makes the most sense for the job at hand. Like you expect with a premium rotary hammer, Makita gives you both chipping and hammering with rotation modes. A third stop on the control dial allows you to position a chisel in any of 24 positions to get the best angle on your work. While the entire tool is impressive in its own right, the star of the show is AWS – Auto-Start Wireless System. This Bluetooth connection between the tool and dust extractor allows you to operate it just like using the pass-through power outlet on a standard dust extractor. The only difference is there’s no cord connecting you – just the hose to pull the dust in. The number one reason we hear from Pros about why they won’t switch to cordless boils down to too many trade-offs in power and runtime. Makita gives you a solid 8.4 foot-pounds (11.4 Joules) of impact energy. That bests the two original cordless SDS-Max hammers handily but does fall short of the newest FlexVolt model from DeWalt. For a more apples to apples comparison, we have to look at Makita’s HR4013C corded model. It’s essentially the same tool, but the cordless version gets a brushless motor and the controls move around a little. Performance specs are identical with the same impact energy, blow rate, and RPM. That’s great, but can the cordless model really keep up? To find out, we put both models head to head 4000 PSI concrete to see how fast they can drill using a 1-1/4″ bit – the top end of their optimal drilling diameters. When all the dust settled into the bottom of the dust extractor, one drilled 22% faster than the other. The surprise – the cordless model is the faster one! Talking ergonomics with tools this large is much different than the conversation about an impact driver. These are heavy tools that require some muscle to use and produce a lot of vibration. Fortunately, Makita mitigates much of that vibration with their Advanced AVT system, bringing it down to 5 m/s² in lab tests. To make that happen, Makita uses a combination of an air-actuated counterbalance, vibration absorbing housing, and a damper spring at the base of the impact bolt. In use, Makita’s Advanced AVT makes a tangible difference. The amount of vibration that reaches my hands is substantially lower than some of the other models out there. Having used rotary hammers from Bosch, Milwaukee, Hilti, and more, Makita’s vibration control makes a compelling case to be at the top of that list. As near clones of one another, the footprint is identical but the weights are very different. The corded model weighs in at 14 pounds, 6 ounces (not including the cord). The Makita cordless SDS-Max rotary hammer is a couple pounds heavier at 16 pounds, 8 ounces. That’s about what we expect. The batteries add 2 pounds, 12 ounces, and the brushless motor saves a little weight to bring the gap in some. The 4-finger trigger is easy to operate. Since you’ll be using the hammer with a full grip on the handle and trigger, there’s no issue of finger fatigue that you might find on a 1- or 2-finger trigger. You get two auxiliary handle choices to make life a little easier. There’s a standard single bar style and a D-handle style. Both have additional overmold to absorb more vibration. 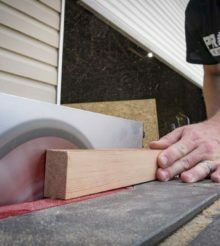 Pro Tip: Use either handle for chiseling, but stick with the single bar handle for drilling. It puts your arm in a less vulnerable position in a bind up. As a kit with 5.0 Ah batteries, the Makita cordless SDS-Max rotary hammer will set you back $799. That’s a couple hundred dollars more than the corded model. Here’s the kicker, though – if you already have the batteries and charger you need, either one is $599. Compared to DeWalt and Milwaukee, the 2-battery kit price is the same for the FlexVolt and M18 Fuel 1-9/16″ SDS-Max rotary hammers, and Makita has significantly more power. But if you feel like reaching higher to the 1-7/8″ FlexVolt rotary hammer, you’ll also have to dig another $200 deeper in your wallet when it comes out. Cordless performance that outperforms corded in the same class is impressive on its own. The Makita cordless SDS-Max rotary hammer goes way beyond that will excellent ergonomics and connection to their AWS dust collection system as well. The only downside is that for all-day work, you’ll need to cycle through 4 batteries. But they charge fast enough that you only need 4 batteries to work continuously in drilling applications. If that’s not an obstacle for you, there’s never been a better time to cut the cord on your SDS-Max rotary hammer. So how well does a hammer like this work against granite? There are some rocks in my yard I’ve wanted to cut some steps into for years. Is that kind of work feasible, or are these only practical for use against concrete?